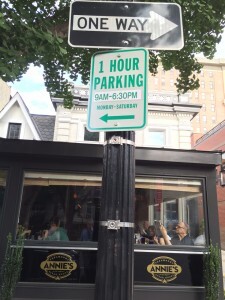 WASHINGTON — Some people joke that you need a PhD to interpret D.C.’s parking signs. Apparently, having a J.D. isn’t enough, either. Mary Elizabeth Strayhorne parked near Annie’s Paramount Steakhouse, near 17th and Q streets in Northwest, in July. One sign told customers that it was a one-hour general parking zone. 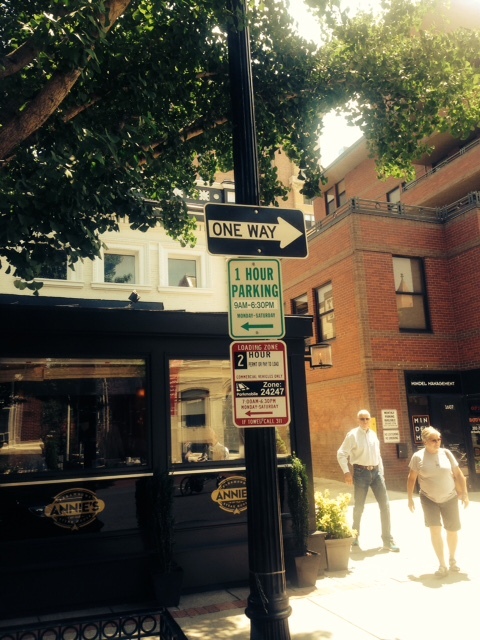 Below was another sign that told customers it was a restricted commercial loading zone during the day. Strayhorne has lived her entire life in the D.C. region and is quite familiar with Dupont Circle. She said this incident reminds her why the city can be so unfriendly to drivers. “A lot of people that I’ve heard are concerned that these conflicting signs are being put there intentionally to gather revenue, to take advantage of the confusion,” Strayhorne said. Strayhorne also is concerned about the impact it can have for the city’s economy if people are frustrated with parking. WTOP showed a photograph to the D.C. Department of Transportation, which wrote the ticket and is responsible for parking signs in the city. “After an internal investigation, we have realized that the signs are in conflict with each other, and the ticket was given in error,” DDOT spokeswoman Michelle Phipps-Evans wrote in a statement to WTOP. Two weeks later, the loading zone signs were removed.